Find answers to common questions about our driver's education services. If the student does not complete the course (including the 6 hrs. of behind the wheel driving instruction) within 1 year from your sign up date OR the permit issuance date, whichever is most recent, a $75 contract reinstatement fee will be assessed in order to renew the contract for another six months. What happens if I cancel late for a lesson? A charge of $45 will be due should there be a late cancellation. This fee will be enforced if a lesson is not cancelled before 5pm the previous business day, if a student is more than 15 minutes late for a lesson, or a student does not physically have their permit in hand at the time of the appointment. No further lessons may be scheduled until this fee is paid in full. 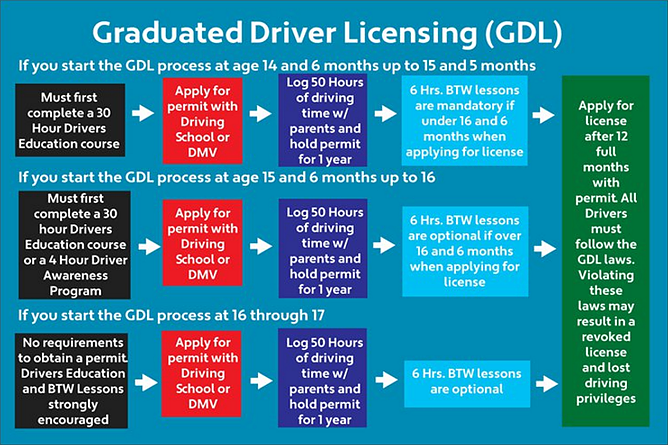 When is a student eligible to begin Drivers Education? Students may begin drivers education at 14 years and 6 months old. How can I apply for the Denver Metro Teen Drivers Scholarship? How do I know which option is best? Check out the GDL Laws for Colorado here, or you can contact our office and we can answer any questions and put you on the right path. What is the difference between the in-class option and the online class option? The in-class option is more social and interactive. Videos and worksheets are incorporated as well as power points and guest speakers. These classes are scheduled in advance and all classes must be attended. The online version allows the student to learn at their own pace and complete the classroom instruction at their convenience. Each page is timed which requires the student to complete the full 30 hours of class instruction. What documents are needed to take a classroom instruction? You must provide the proof needed for the age of your child to take the 30 Hour class which is 14 yrs and 6months of age. When enrolling in the 4 Hour class, we request a copy of the student's birth certificate at the time of registration. The 30 Hour In-Class option will have class times listed on the schedule. Students will receive a breaks each day for lunch and 10 min breaks every other hour. The 4 Hour class runs from 8am until 12pm for one day. What paperwork is providied to show the DMV a student took classroom instruction? After completing our 30 Hour or 4 Hour class, we will provide all students with a completion certificate which they will then need to present to DMV. When do you administer the permit test? Permit testing is included in all of our classroom courses. Once the class instruction is complete, students will have the option of testing for their permit at that time (assuming they meet the age requirements) or coming back at a later date. Students who need to test at a later date must bring their affidavit with them. How old must a student be to test for a permit? Per state requirements, a student can receive a permit at 15 years of age. They are eligible to test at 14 years and 11 months but are unable to physically obtain a permit at the DMV until their 15th birthday. What documents are needed for a student to obtain a permit from DMV? For more information on documentation needed, please click here and you will be redirected to the Colorado Office State website. What happens after a student obtains a permit? Once a student obtains their permit from the DMV, they are legally able to drive with a parent and begin their 50 hours of practice. If they purchased driving lessons with us, they will need to contact us with their permit number and issue date. When can a student begin driving with an instructor? A student can begin driving with an instructor as early as 15 years of age. They must obtain a valid permit before any driving lessons can be scheduled. What documents are needed to enroll in driving lessons? The student must hold a valid Colorado State permit or license and must submit a registration form. What will the student learn while driving with an instructor? We focus on many skill sets such as speed control, lane control, lane changes, searching, parking, entering and exiting the expressway, and much more. We keep assessment sheets on each individual and where they are currently with each skill. If you ever need a copy or clarification on skills being taught feel free to call our office! How much practice does a student need before their first lesson? We do not require students to have any practice before they drive with us. However, our instruction is more beneficial when students have a minimum of 5 to 10 hours behind the wheel. When do driving lessons take place? Our driving lessons are scheduled based on the availability of both parties. We offer driving lessons between 9am to 5pm during weekdays. Saturdays are also available. Where do driving lessons take place? Pick up and drop off can occur at any of our locations as well as a limited number of high schools in the Aurora, Parker, and Castle Rock areas. For an additional fee, we will pick up and drop off at your home. The cost for this service begins at $10 each way. Why can't I schedule all my driving lessons at one time? To minimize the number of cancellations and rescheduling efforts, we only schedule one lesson at time. To schedule multiple lessons at one time, you must purchase the A-La-Cart option. What happens when I complete all six hours of driving lessons? After completing all driving lessons, we will email a six hour certificate which you will need to provide to the DMV. The email is from the DMV because that is where we are certified from. Please note, we recommend that you take a picture of all certificates received should you need a copy for insurance purposes. If you need a copy from us, the cost is $10 cash; to replace the certificate it is $20 cash. When do driving lessons expire? Driving lessons are valid for one year from the sign up date or the permit issue date, whichever is most recent. We recommend that one lesson be completed every 4 months. What vehicle is used for the driving lessons? Currently, all of our vehicles are 2012 or 2013 Ford Focus'. Is there an extra steering wheel and brake for the instructor? Our vehicles do have dual brakes but only one steering wheel. Do you provide a road test for everyone? Yes, our road tests are available to anyone who needs to obtain a license. When can I schedule my driver license road test? We offer road testing Monday through Friday between 8am and 2pm. Saturdays are available upon request. The DMV is booked out too far. Can you get me in quickly? We can not guarantee that we can schedule you immediately. However, if you are flexible in your testing location, we can usually find an appointment in the same week. Please contact our Aurora or Castle Rock office to schedule a road test at any of our locations. What documentation do I need for a regular road test? Anyone wanting to take the test will need to show their permit and provide payment prior to testing. If you are under 18, we request that you bring your 50 hour log sheet so we can look it over for you and make sure that the DMV will accept it. If you are under 16 and 6 months, we will require your 6 Hr. certificate in addition to the above mentioned documents. What documentation do you require for Interlock testing? First, we will need to see your permit. As this test is done in your vehicle, you must provide current registration and insurance. All lights must be in working order. Windows and doors must be fully functional. Your odometer and other meters on your dash must be functional and visible. Your side mirrors and rear view mirror must be attached. No major windshield cracks. Overall, your vehicle must be able to pass an inspection. We will not complete the test if these requirements are not met. What happens if I pass my driver test? If you pass, we will provide a certificate which you can immediately take to DMV to obtain your license. You must go to a full service DMV. What happens if I fail my driver test? Students who fail have the option of testing again at a later date. There must be 24 hours in between each test. If a student fails twice, any remaining attempts must be scheduled at the DMV.